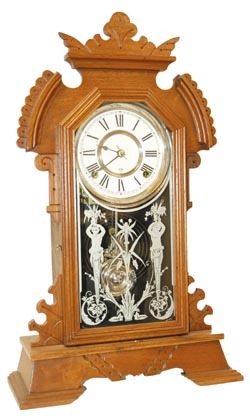 Ansonia Clock Company walnut parlor clock, "Ohio", C. 1891. Very attractive 22" refinished walnut case, very clean, near perfect. Of particular note is the original glass with silver figures holding flowers above their heads, and other flower and plant designs; then the fancy silver-nickel bob and the silver-nickel dial rings. Most of the label remains on the back, paper dial no doubt a later replacement although showing signatures. The movement is 8 day, striking half hours on a coil gong, and runs exceptionally well. Ehrhardt, Book 2, page 21.